When Laurie Clow travels to London, distracted as she is by her mother’s dementia and an odd incident with a friend, she finds herself witnessing a horrible traffic accident and spending with Arthur Hayman’s last few moments with him. After his death, she meets his family, including his son, Luke, who is the title character in Arthur’s series, “The Hayseed Chronicles.” Staying with the family through the funeral, Laurie has the opportunity to read all the books and is immediately charmed. When she returns to California, her trumpeting of the books begins to elevate media awareness of both the books and Laurie herself, changing irrevocably the lives of all involved. I really enjoyed this book for what it had to say about fame, and the culture of fame: the difficulties, the way people think they own the things they love, how easy it is to suddenly find yourself going off the tracks. Luke narrated the majority of the book, and was a very insightful narrator. My biggest issue with him is that he often felt more like the narrator than like the main character. Part of this is because he was telling this story from his vantage point at the end of the novel, but it still didn’t quite work for me as well as it could have. One reason for this may be that none of the characters were easy to empathize with. Laurie was a great character at the outset, but she was much changed by fame, and that change seemed so sudden, from Luke’s point of view in not having seen her for some time, that it was hard to understand where she was coming from at that point. My other minor qualm with “Mr. 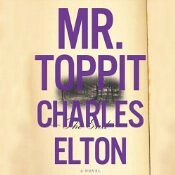 Toppit” was that there seemed to be an awful lot of setup to get to the point where Elton could offer the reader a view of how fame changes people and their lives. That really is the main thrust of the book, but the “Hayseed Chronicles” did not take off until approximately the midpoint of “Mr. Toppit,” and I found that first part somewhat hard to get into, although ultimately worth the wait. I do want to mention, Arthur died at a point when his series was ultimately unfinished, and I got the cold sweats ‘what if’ing J.K. Rowling dying somewhere in the middle of Harry Potter. Imagine what would have happened! Of course, in “Mr. Toppit” Arthur does not find fame until after his death, but the comparison still nearly gave me nightmares. Simon Vance was narrating, what else really needs to be said? It was Vance’s usual fabulous narration. Really the audio production was strong overall, there was a complete absence of any noticeable variations in sound quality or problematic moments of narration. A good book, one I can recommend for those interested in a commentary on fame, but not one that will intrigue all readers. I can definitely recommend the audiobook, because Simon Vance helps greatly at moving the reader through the slower portions of the book at the beginning. Need another opinion? Jennifer from Literate Housewife and I read it together, and her review is up too!